The longest piece in the collection (which isn’t saying a lot) “Necronauts” tells of a blind artist asked to join the strangest project he’s ever been commissioned for. A rogue scientist having developed the technology to induce death and then revive people, the artist is asked to produce images of the things he “sees” on the other side. When a woman joins the project, things get interesting. Resolved ambiguously, the story strikes a human chord. A real estate developer’s spiel, “Are There Any Questions?” tells of a miraculous new use for trash. Turned into a malleable yet solid form of terrain, new opportunities for landscapes and suburbs come available. Sounds good, right? A bizarre little story that may not resolve itself in fully satisfactory fashion, “Two Guys from the Future” tells of a struggling artist and the two men from the future who visit her one evening with an offer. Working night hours as a security guard at the art gallery she would love to have her work displayed at, the offer is money for a selection of specific paintings that can be taken to the future and thereby saved from an imminent holocaust. The artist discovering ‘holocaust’ can be relative, it’s a story that moves in unpredictable directions. Almost a dialogue story (just not quite), “The Toxic Donut” is a light bit of satire commenting on the uncertainty surrounding the amount and degree to which synthesized chemicals have infiltrated human existence, and their NIMBY effect at the personal level. Perhaps more an idea than a story, “Partial People” acts as an allegorical stand-in for the incomplete manner in which we view, and potentially treat, others. A wonderful piece of environmental satire, and one of the best in the collection, “Carl's Lawn & Garden” tells of a landscaping crew in a near future where real vegetation is a rarity. The crew’s skill set beyond botanical and into the technological, maintaining holo-trees and engineered synthetics is wonderfully imagined (the faux-flora are superb). But where the story real gains momentum is the perpetual tongue-in-cheek Bisson applies to the setting’s environemental standards. The last bit of the satire, “By Permit Only” is a story that escalates the absurdity surrounding government influence on human activity through the mechanism of permits and permissions. The collection ending on an unequivocal note, “The Shadow Knows” tells of a retired astronaut called back into service by the discovery of a strange alien form in the Voyager probe when it returns to the solar system. The alien form not physical, it nevertheless carries a message, one that will touch all humanity. An interesting story that resolves itself in a fashion nobody could predict. There is no tight, defined statement that summarizes Bisson’s collection in niche terms. Only in broad terms—that Bisson is a writer capable of addressing a wide variety of societal issues through subtly precise prose, characterization and sense of ‘story’—can it be summarized. Each story is crafted in its own right from its own material, and is overlain with some layer of poetry/allegory to gain relevancy, typically drawing all the story’s stings tight in the final paragraph. 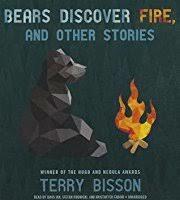 In the end, Bears Discover Fire and Other Stories is a very solid collection well worth the read. With nineteen stories, not every one is a knockout, but there is a quiet, consistent quality to each, not to mention the third option—the non-standard means of resolving a story. Authorial intelligence hovering below each story but typically not made apparent until the last page or line, the collection is not flashy or commercial, but certainly more sophisticated—rewarding for the reader who likes to look below the surface. In context, I would peg Bisson as a writer loosely akin to Robert Sheckley. Each writes stories that possess a defined wit poking at life and the world without bald jokes or obvious winks at the reader. A number of the writers you list, Jonathan Carrol, James Morrow, James Blaylock, Caitlin Kiernan, Kij Johnson are writers I have read a little or a lot, but all with some appreciation of their craftsmanship. I read several of Johnson's stories after reading your discussion of her hPL inspired novel, her 26 Monkeys goes right up there with Carroll's Fall Collection and A Wheel in the Desert, and the Moon on Some Swings as being among my favourite short stories. So I will be looking at not just Bisson but the other writers you mention. This looks fantastic! I recently read a very small book of short stories (Paradise & Elsewhere) and am looking for more of those kinds of slightly-scifi stories, so I'll give this a try! And thank you for the Kathy Page recommendation. A quick look around the internet makes it seem like she's a writer worth looking into.